Am I a Professional Now…? Our local bookshop…where my trilogy is available in e-book form! Don’t laugh; I’d been asking myself that question since September 2015, when A Division of Souls first went up for sale online in e-book form. Can I call myself a real professional writer at this point? Well. Depends on who I ask. And I’ll get positive answers, indifferent answers, negative answers, ‘you’re not there yet’ answers, ‘oh bless your heart’ answers, pedantic answers, and everything in between. I’ll be honest — I haven’t asked anyone that, and I don’t plan to. Sure, I’ll ask people for their opinion on works in progress. That’s what beta readers are for. I’ll ask for creative advice if it’s needed and/or warranted, because I want the end result to be done right the first time. I’ll definitely ask for advice about self-promotion, because it’s one of my weaknesses. I’m doing all the homework expected of me to make sure I’m doing it all correctly when it comes to the legalese and financial stuff. But I decided pretty early on that asking someone else about my professional status is kind of self-defeating. Again, I came to this conclusion by comparing my own writing career to that of a musician’s. I understand that particular field reasonably well because of my lifelong obsession with music and my willingness to read all kinds of music bios and academic texts (and meet the musicians if possible!) to learn even more about it. I find that putting my writing life into this kind of perspective has made my choices so much easier and less painful. But my point being: Sure, why the hell not call myself a pro now? I’ve got three completed novels out, released through well-known, respected independent avenues. I’m already working on my fourth, with future books at pre-planning stages. All parts of the production have been done by my own hand — editing, cover art, formatting — mainly because I wanted to do it that way. I want to learn the business. I’m still learning the fine art of promotion, but I’ve already done a lot of homework on it and am now acting on it. Same with the legalese and the economics side of it. Both are definitely daunting, but I’m willing to learn so I can do it right. I’m now attending conventions not just as a fan, but also as a panelist. I set myself some high standards from the beginning, so as to not make my work look like I’d thrown it together at the last minute. Importantly: I know I’m not a commercial writer. I tried writing that way, and it didn’t pan out. I’m fine being a college radio author instead of a Top 40 radio author. In fact, I kind of prefer it that way. Most importantly: This is a life-long career goal of mine. I’m duty bound not to do it half-assed. Sure, it’s all DIY, but it’s a professional-level DIY. This is me being inspired by the American punk bands of the early 80s putting out their music on their own, passing out cassettes or starting labels like SST and Taang and Alternative Tentacles and Ace of Hearts. They were never going to hit the charts during their heyday, and they usually had a small following…but they had a STRONG and loyal following. They also all had a very strong bond with each other, like an extended family. Once I realized the writing field works in almost exactly the same way, I knew I could do succeed as a professional author. An indie author, but a professional one. So tonight I decided to play around a bit with the cover for The Balance of Light, even though it’s still quite some time before it’s going to see ebook or print. This one was tough, because I had an idea of what I wanted, but looking for the right picture was going to be a tough one. I wanted something to balance out the blue/yellow night view of A Division of Souls, so I knew it would have to be yellow/blue and morning. I had the color scheme down, but the picture was the tough part. I’ve said before that I really love this part of the self-publishing process; I mean, really love it. Like, to the point that I may possibly do this as a side-job in the future. I love looking for that perfect shot. Trying to get the perfect crop balance. Figuring out whether to adjust the color or give it a bit of an effect. Playing around with fonts and text placement. I’ll be honest, it’s like I’m making fake album covers. It’s something I used to do as a teenager with my mixtapes and the Flying Bohemians tapes. 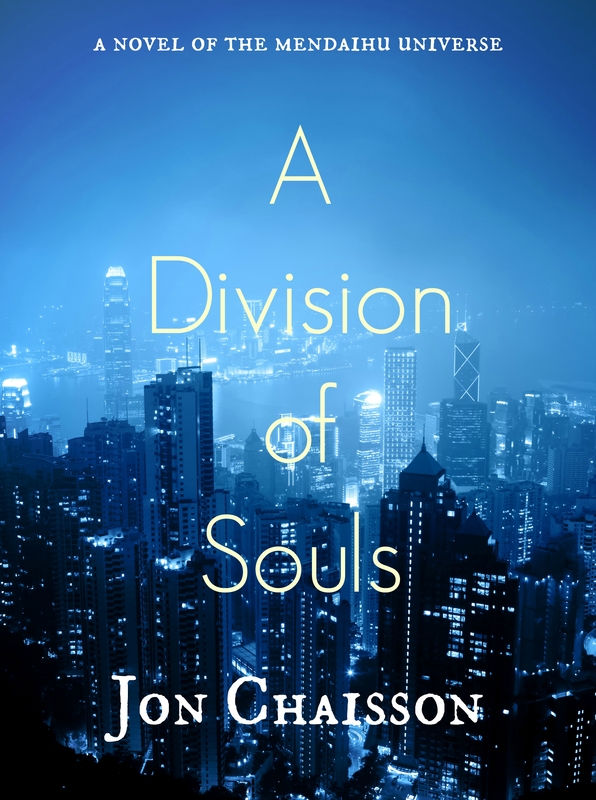 The cover for A Division of Souls was meant to invoke a few things: the setting (a metropolis, teeming with people), the time (at night), and mood (tense and mysterious). It’s also to serve as a tie-in to the very first scene. In short, my aim was to say: this is what the book’s going to make you feel. The cover was also supposed to tie in with the other two books, which means that I also had to think ahead: what were the other two going to look like? I knew I’d have to keep a few visual motifs going…a city would have to be involved in all three, somehow; the images would need to evolve, just like the story itself. In this case, I created multiple ‘lightboxes’ in my Shutterstock account and started looking for pictures that would do exactly what I needed them to do. The time it took to throw this one together was surprisingly quick, to be honest. Looking at it now, I can see a few things I should fix, but for the most part it went smoothly, once I knew exactly what I wanted to do. The cover for The Persistence of Memories was a bit trickier, and I think it looks better as an e-book cover than it does as a trade paperback cover, but I do like how it came out. The same rules applied here…in this case the setting was twofold: it takes place both on Earth and on Trisanda, so I chose to do a ‘satellite’ point of view that shows both the city below and the stars above. Time seems to be fluid in this shot. It seems to be late night in the city below, blanketed by the similar blue (not exactly the same but close) of the first book, but in the heavens, time is irrelevant; it’s all light and dark at the same time. It also creates a dreamlike mood, where you’re not entirely sure what’s reality and what isn’t. The placement of the title was purely serendipity, to be honest; I did not expect the top two words to be in space and the bottom two to be in the planet’s atmosphere. It just turned out that way and worked out quite nicely. Funnily enough, once I’d noticed that, I was torn on exactly where I should place it…the other outtake had the title dropped a tiny bit lower, so the “of” is resting right on top of the gray cloud line instead of hovering over it like it is. I’m still playing around with the font color for the title, as well as the placement of the text. The picture hints at the metropolis of ADoS, but the mood and the time is different: we’ve gotten through the late night of Book 1 and the witching hours of Book 2, and now we’ve come to the morning after of Book 3. 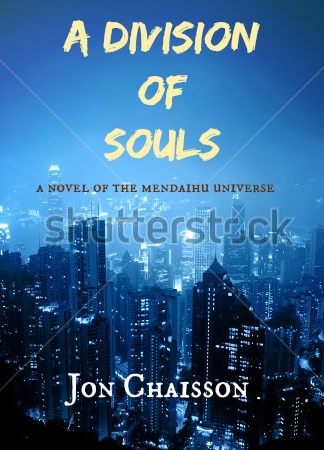 The yellow of the sunlight is supposed to hint at the yellow font of Book 1, and I’m still trying to figure out which bluish hue would be good for the title (to hint at the blue cityscape of ADoS). True, it does kind of hint at new-agey books, but that’s kind of the point…the characters and the planet itself has gone through a spiritual awakening of sorts. And like Book 2, it serves a dual purpose: the physical awakening from that dreamlike state, and the spiritual awakening. One thing I learned early during this process was that I shouldn’t merely look for something that ‘looks cool’, no matter how tempting it may be. The last thing I needed was to look for something shiny, because I didn’t want the casual viewer to say ‘wow, what a flashy cover’ but not completely connect with it or remember it. I wanted something unique. Something that stood out from other covers, not because it was the flashiest, but because it was different. Something to catch their attention because it stood out just enough. These first three are my first attempts at doing book covers, and as you’ve probably noticed, there are no actual people on the cover. This was a conscious choice; not only is it because of the large cast, but because I also wanted to invoke the idea that it wasn’t just my characters being affected by the story, but planet itself. My next couple of projects do involve a much smaller cast, so there’s a very good chance I may use people (or silhouettes) on their covers. I did a brief Shutterstock search for those and found a few ideas to work with, and I’m looking forward to these when I get to that point. The main drafts of these stories haven’t even been written yet, or at least not completely, so again this was a bit like creating fake album covers! In the process it’s giving me something fun to look forward to. The decision to pull out of a writing project is a strange one. It’s never a knee-jerk reaction. More often than not, it’s a laborious, emotional, drawn out process. All kinds of questions arise, whether it’s worth soldiering on or cutting losses. The feeling of frustration and irritation due to wasted time. And even the relief (and the guilt of feeling such, despite the decision) when the deadline is no longer hanging over the writer. I say this now, as I seem to be on the fence on a current long-term project at this time (don’t worry, it’s not Mendaihu Universe related). I won’t go into detail just yet, as I’m still debating on what move I’ll take, but suffice it to say, the end result is different than what I’d expected it to be. It’s starting to feel less like a publishable book and more of a private ‘vanity’ book…something that would appeal to me, but probably not to too many others. Will I finish it? I most likely will, given that I’m close to the end of the initial rough draft anyway. I just may not self-publish it. It’s a tough decision, and one I’m not taking lightly. It’s not exactly frustrating that it may take this direction…just that it feels weird, signing off something that had potential at one point. So, fellow writers….ever have this quandry? I’ll be honest, just the mere fact that I’ve already got over two hundred downloads at NoiseTrade Books makes me an incredibly happy writer. Thanks to each and every one of you! I went into this gig knowing I had a good book that I think people would enjoy, but had little to no idea how well it would go over. Seeing that many downloads over the course of one week confirms that whatever I did with the book, it looks like I did it right! So, where to go from here? Well, the subject line has been a bit of a mantra over the last few weeks for me. The behind-the-scenes work for a writer (and especially for a self-published one) has been that there’s no downtime at all. We’re constantly moving forward. We’re juggling the writing with the promotion with the Day Job with the other mundane yet important things in life. And let me tell you, the schedule has been rather busy as of late! Fear not, dear readers, I am working hard on editing the book’s sequel, The Persistence of Memories, and hope to have it released via the same channels by the beginning of next year. I hope you’ll enjoy the second book; it’s my favorite of the three, and there’s a lot of interesting and surprising stuff that goes on within. Heck, I may even give you some spoilers once I’m further along! What else do I have on tap? Well, I do have my music book/personal memoir Walk in Silence, and I’m aiming for a late April 2016 release date for that one. There’s quite a bit of work to be done on that one, so it’s going to need some serious TLC this winter. [For those of you unfamiliar, WiS is about my love for college radio and how alternative music shaped me over the last thirty years. I talk more about it on my other blog of the same name.] I’m also working on the next Mendaihu Universe story in my spare time. That’s been put on a brief hiatus while I work on self-releasing the Bridgetown trilogy, but it hasn’t left my mind! I will definitely return to it once I’m caught up with the production end of things. Above: the MS Word document I’ve been carving away at for the last two months. Below: the final result in EPUB format on my Nook. Lon Dubh the blackbird approves. –A mixture of elation and pride. More often than not this is a project that has taken far too long for our liking, but still the author has a bit of a squee when they see it all bound in paper or in final ebook form. Look at that! I made a thing! A professional thing! A thing others will (hopefully) enjoy! –The turnaround time from the above excitement to worry and mortification when typos and other mistakes reveal themselves when you’re checking out how pretty it all is: +/- two hours. 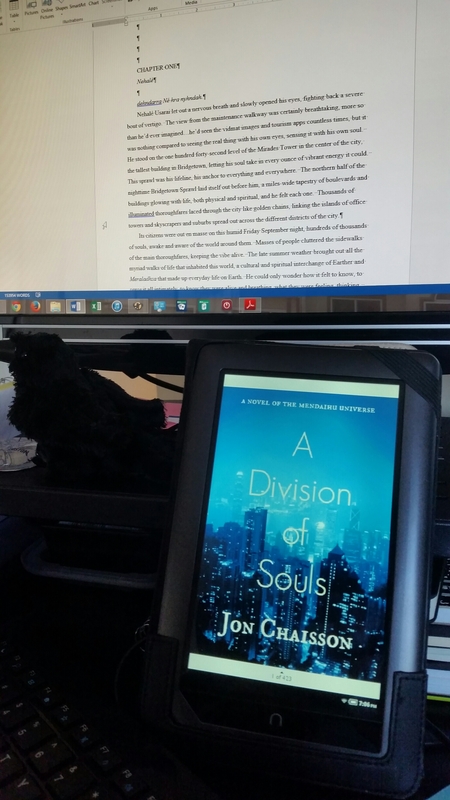 Most of this weekend was spent working on the formatting of A Division of Souls, which was easier than I’d expected it to be. Come to find out, most of it entailed highlighting blocks of text and adjusting a lot of Settings, which I do all the time anyway. Saturday afternoon I cleaned up the end matter (glossary, acknowledgements, etc) and other easy bits. Sunday was spent doing a lot of Style changing — primarily my old habit of hitting Tab at the start of every paragraph to a permanent 0.3″ paragraph start instead. Ctrl+A was my best friend through most of this. Creating a table of contents was shockingly easy. Just a bit of bookmarking and hyperlinking, et voila! I’m done. There was also a good half hour of dithering about line spacing…single, 1.15, or 1.5? Single looked too crowded to me, and though I liked 1.15 myself, A. (who reads more ebooks than I do) felt otherwise. So 1.5 it was. So by late afternoon, I was ready. It was time. Uploaded the file to the Meatgrinder at Smashwords (their quite apt name for the software that checks for errors and also translates it into multiple formats). Waited for the scanning and the translating. Waited for the email letting me know if there were any errors. At 6:52pm PT, I got the email; no errors, everything was groovy, and it was now on its way to being available at all fine ebook retailers. I’ve also added a ‘Buy Stuff’ tab up at the top of this blog to make it all official and stuff. So yeah. I can now finally say I’m a pro. Go me! –Apparently epub doesn’t like accentuation marks in the glossary, so I’ll have to use caps instead. –An event I’d decided to rename, that got missed a total of three times. A bit of Find/Replace did the job. –A few places where the carriage returns didn’t take. Easy enough to clean up. Today’s work included taking the step of buying a stock photo and finally utilizing my sort of decent art skills for future profit. I used the most basic plan on Shutterstock: $41 for five downloads, four of which I’ll use at a later time for the other two books in the trilogy, and maybe a future project or two. That was the easy part. The hard part was thinking three or four steps ahead before I even started. There are a few things that I had to keep in mind before I went anywhere with this. —Image Resolution. Many places like Smashwords and BookBaby require high resolution of the finished product. This is so your potential readers will see a nice clear picture on their e-reader, and won’t cause pixelation (i.e., it won’t look all blotchy and fuzzy if you blow up the picture larger than necessary). Thus I downloaded the highest resolution, which I believe was 3400 x 3400 pixels. Much higher than necessary, but after cropping, it still looks good. —Cropping ratio. This is something that is actually pretty important yet not too many people think about. The most common ratio for e-book covers, I’ve read, is 1:1.33. That is, 1.33 times taller than it is wide. And looking at this cover take, that makes sense, because it’s roughly the same shape as most tablet and e-reader screens. I admit I went a bit lo-fi here to figure it out: I took a ruler and measured the picture on the screen. In the above thumbnail here, it’s 2.5″ wide. If you multiply that by 1.33, you’ll get 3.325″, which is very close to the height I ended with. —Fonts: color and placement. I have to thank album covers for being able to understand this one. For my example, the most important part of the cover, aside from the visual, is the title, right? So in this version, instead of bannering it up on top like the previous attempt, I chose to spread it down the entire center. The font had to be larger than the other two lines I’d be adding (the subtitle and my name). BUT — it also had to stand out. In this case, I asked for assistance from one of my artist friends: since I knew I’d be using this photo and that its primary color was blue, what is the opposite of blue? 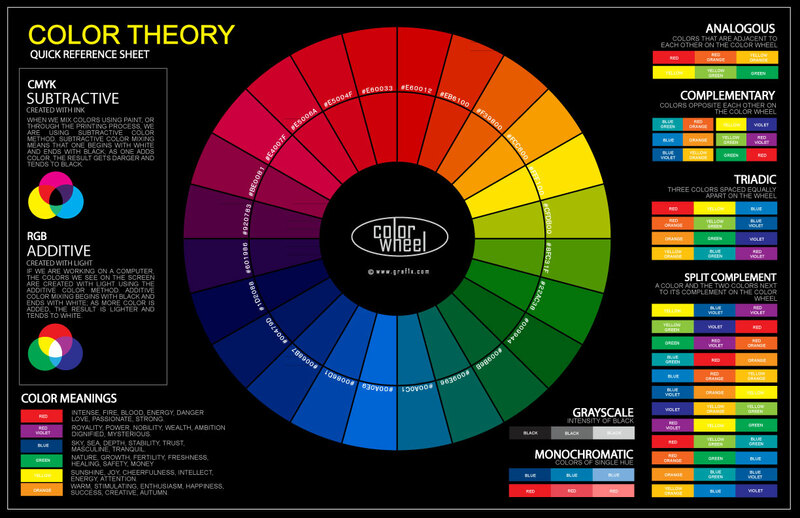 [This is actually pretty easy to figure out: here’s a color wheel chart you should save for reference!] In this case, it’s yellow, so I used a very light shade of it for the title, to make it stand out, even more than the subtitle or my name (both in standard white). The fonts themselves were provided on the free version of PicMonkey.com…the title is Geo Sans Light and the other two are De Walpergen Pica. All three were placed with a bit of ingenuity: I aligned the sides of the text blocks with the sides of the picture, and had everything center-aligned. —Clarity. My original outtake in the previous post used the Edo font on PicMonkey, but here my wife suggested a different, plainer font. It’s a bit unexpected to be sure, because it doesn’t look like a genre font. It’s classic and plain, but it still looks professional. The trick here was to ensure that none of the words vanished in the white spots of the picture behind it; yellow stands out well against blue, but gets lost against white. Everything is readable, and that’s the most important part. —Viewing it in different sizes. This is another thing that sometimes gets glossed over or forgotten, but it’s actually quite important, and ties in with everything else. Think of it this way — say you’re looking for that new book you know has just come out, but you need to scan the New Release shelves and the endcaps in order to do it. Chances are when you see it, you’ll be at least a good ten or twenty feet away. Same goes with e-books: when you’re browsing online, you’re not looking at the actual-size cover, you’re looking at a thumbnail cover. This is another reason I downloaded the high-res version: the picture itself doesn’t look too sketchy, but more importantly, the fonts are still readable. It’s okay if the subtitle is fuzzy; it’s not important. What is important is the title and my name, so I had to make sure they were large enough to be read. This is why I’d tweeted it right after I’d completed it: I wanted to take a look at it on my phone, to see how it looked on a much smaller screen, plus I’d get feedback from my friends as well. Granted, I already own Photoshop (a birthday present from a few years back), and I’m kind of lucky that I have a lifelong interest in art and a passable ability for it, so I’m able to do most of this myself, which is exactly what I wanted to do. Some of you may want to hire out a professional cover artist instead. There are many out there — The Creative Penn has some good links to a few out there, for instance. And many of them are quite affordable. In the end, the cover still remains one of the most important parts of the book (or e-book), because it’s the first thing every reader sees. You can let the pros take control of the cover creation, and all you’ll need to do is explain the images you’d like to see. But if you have the ability and want to go it alone, definitely keep the above in mind. Don’t just throw something together and call it done, either; just like musicians, save a small handful of differing takes and use the one that works best. First mock-up cover, with help from a Shutterstock sample and a half hour on PicMonkey. NOT THE FINAL VERSION. Small steps. That’s what writing novels has been about for me. On the surface it may look like I’m one big mess of contradictions: deep focus on ideas but extremely haphazard drafts; some really tight writing balanced out with a handful of ‘screw it, I’ll fix it later’ placeholders; things that pretty much every writer needs to go through. We create a hell of a lot more than what ends up in the final version, and a lot of it does tend to be directionless wriggling, trying to figure out where the hell we want the story to go. A lot of small steps. Missteps, steps into slippery mud, and blind kicks into the air, with the hopes that the end result is instead a well-choreographed saunter down a red carpet, fans cheering at the sidelines. And one giant leap, making the decision to publish. Last week, I made the decision that I was going to work with one of the indie self-publishers and finally release the Bridgetown Trilogy into the big bad world. This past week I’ve begun preparing myself for an early September drop date. Starting one final line edit of A Division of Souls, making various business decisions, starting a detailed spreadsheet for the accounting…and everything else that goes into releasing a book on one’s own. I’m even making my own covers, with the help and feedback from others. The one thing I did not expect during this process? I’m enjoying the hell out of it. The research into what publishing services would work for me? The images I’d want for the covers? What kind of expenses I’d be expecting to shoulder? That is, the business side of all of this? I’m really enjoying this part of it. Never thought I’d admit that. Certainly back in my early writing days, I was that writer who was all about the creative spark and saw the economic side of it as the death knell to creativity. [Thankfully I got rid of that mindset right quick.] Now? I’m finding the ‘behind-the-scenes’ work just as fascinating as the writing. I think it’s because I’ve made myself see it similar to the music business, of which I have a decent basic knowledge and a keen interest. Bands rarely if ever go into the studio and slap down a perfect and complete album straight out. There’s a lot of working parts, a lot of outtakes, presales boosting, word of mouth and other bits and bobs that may not be obvious to the passive listener, but are quite important to the end result. Writing and publishing is very similar in that respect. I’m fascinated not just by the creative process, but the amount of work it takes to make it professional level, making all the pieces fit perfectly. I’ve not only been actively participating in all the levels, but I’m learning from them. Am I going to be blogging about it as I go? Of course I am! 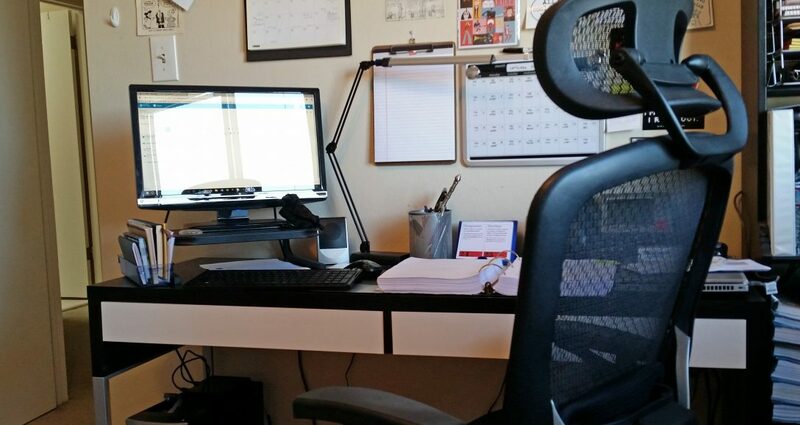 This is the part of the business not many writers and blog readers get to see…and more often than not, this is also part of the business that writers tend to want to ignore (often for good and legitimate reasons). In the process I hope these upcoming posts will also help others who are thinking of following a similar path. So yeah. Here we go. One Giant Leap.